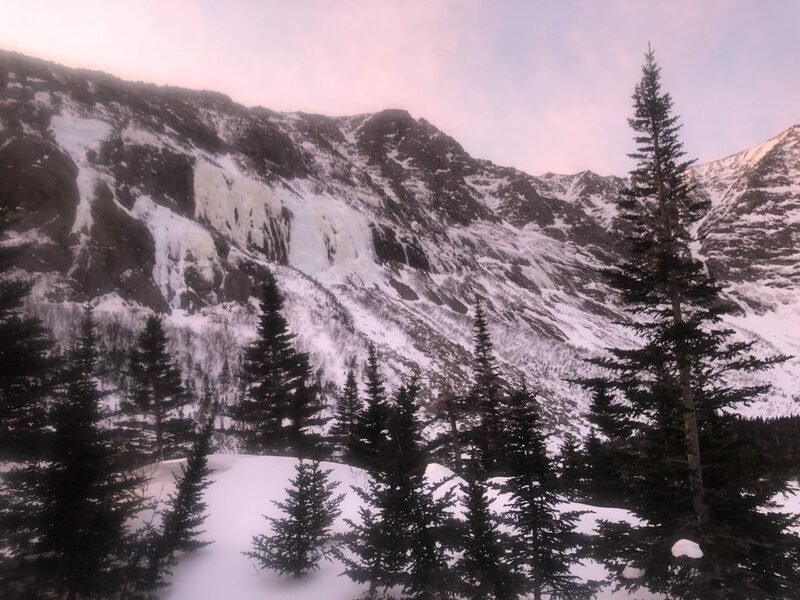 Sunrise panorama at Chimney Pond. We all got up around 5am. We munched down some grandyoats and started to sort our gear. Chimney Couloir in center, Pamola Peak and Chimney Peak on each side. Geoff and Ryan discuss their options. Geoff, John and I had discussed our objective for the day and decided it would start in the South Basin, particularly Chimney Couloir. Chimney Couloir is an elusive place. It’s difficult to see in its full scale unless you are on the summit of Katahdin or on Hamlin ridge. 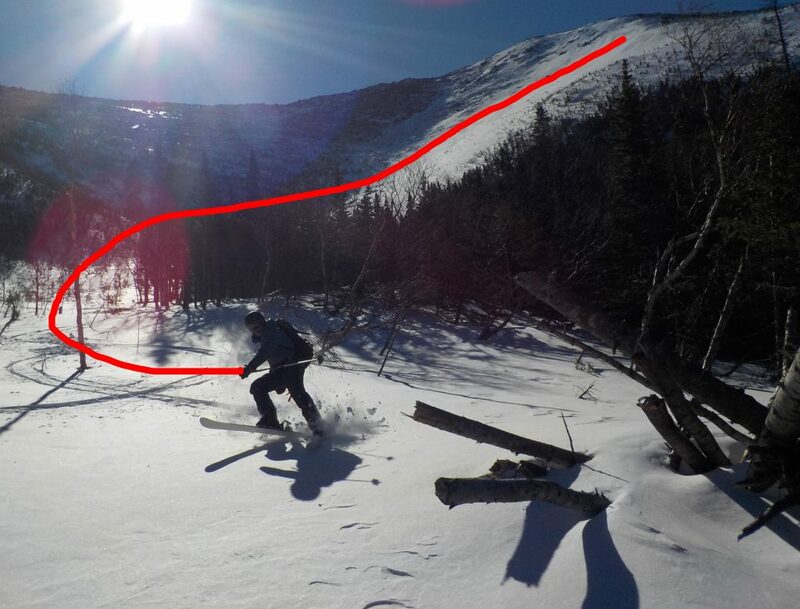 Few have skied it, I believe the first descent dates back to 1993. 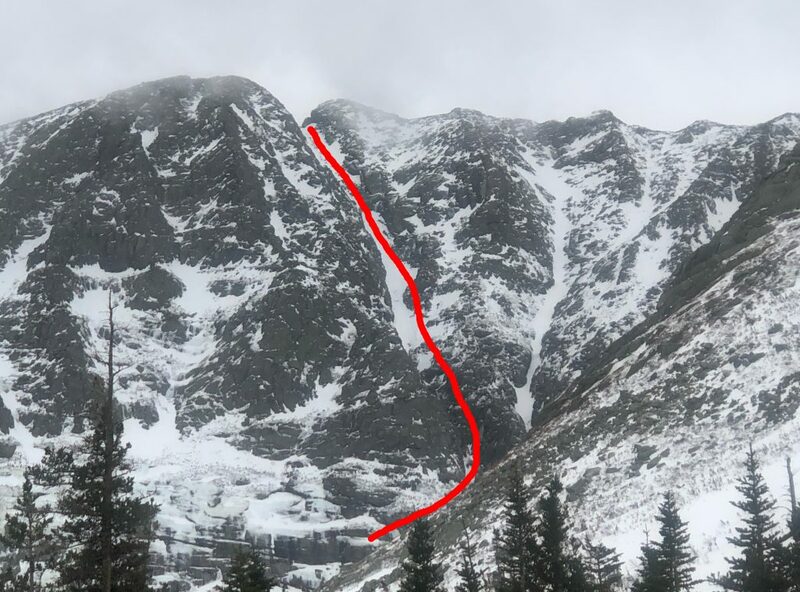 This has been of interest to me because of the challenge, remoteness, and danger which is involved with skiing/climbing this Couloir. To be able to experience it would be very satisfying. 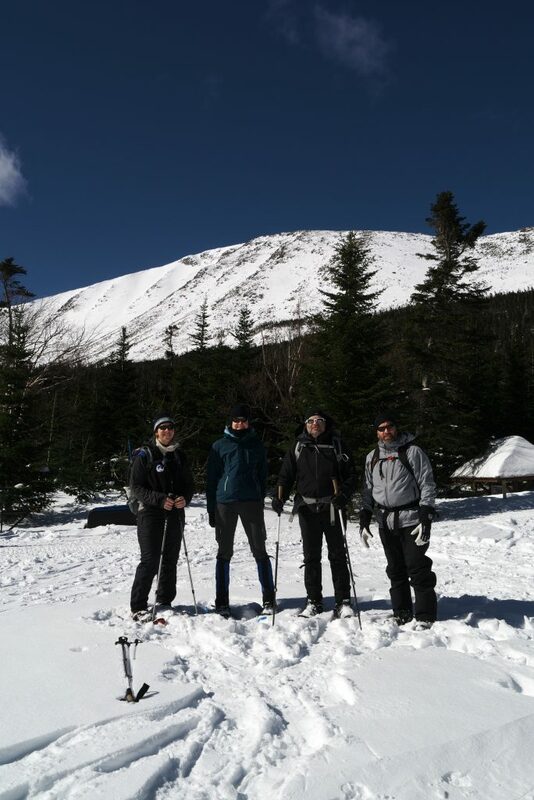 Adam, Reggie, Pete, Emily and Carrie (as I recall) planned to climb Hamlin Ridge toward Katahdin’s summit. Only Adam and Reggie had definite plans to make the push all the way to the top. 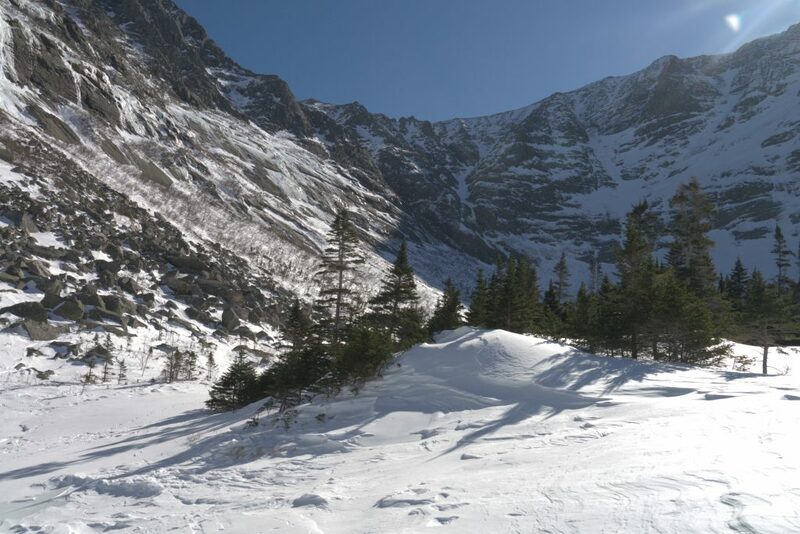 This route doesn’t pass through any avalanche terrain, but does require trekking a considerable distance above treeline. This leaves hikers very exposed to the wind and cold. We were fortunate to have an excellent window of weather for this day. Geoff, John and I headed into South Basin sometime after 7am Saturday morning. The wind was howling like crazy. 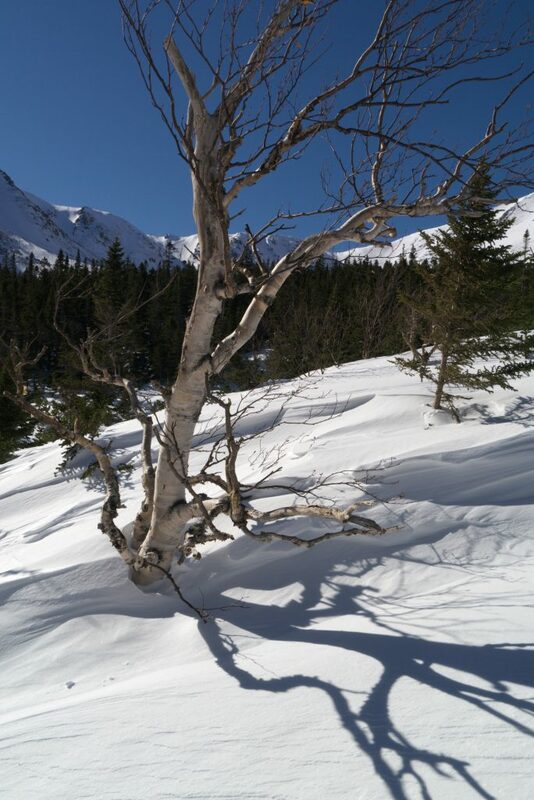 The snow pack was very stable. 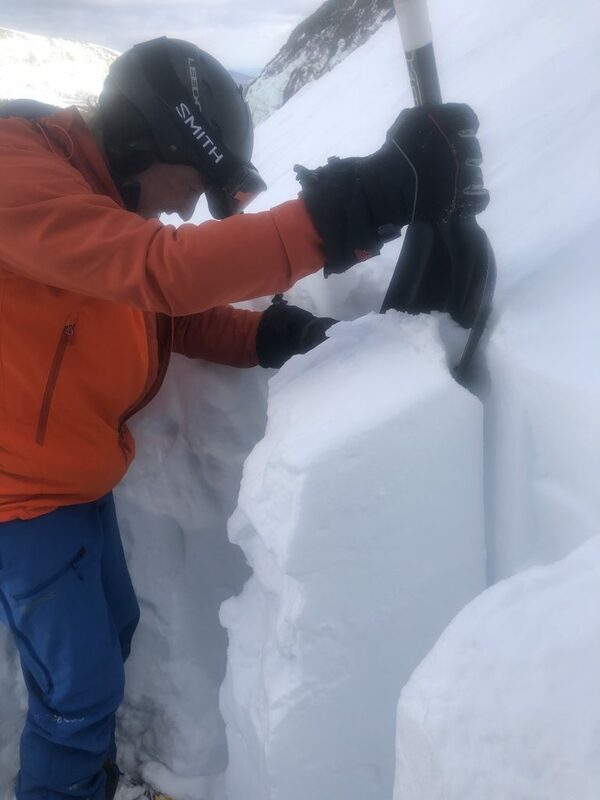 We went forward with our compression test and yielded no results or instability as far as 4’ deep into the snow pack. Geoff in the lead as we begin our climb up Chimney Couloir. Slope angle likely 40-45 degrees. 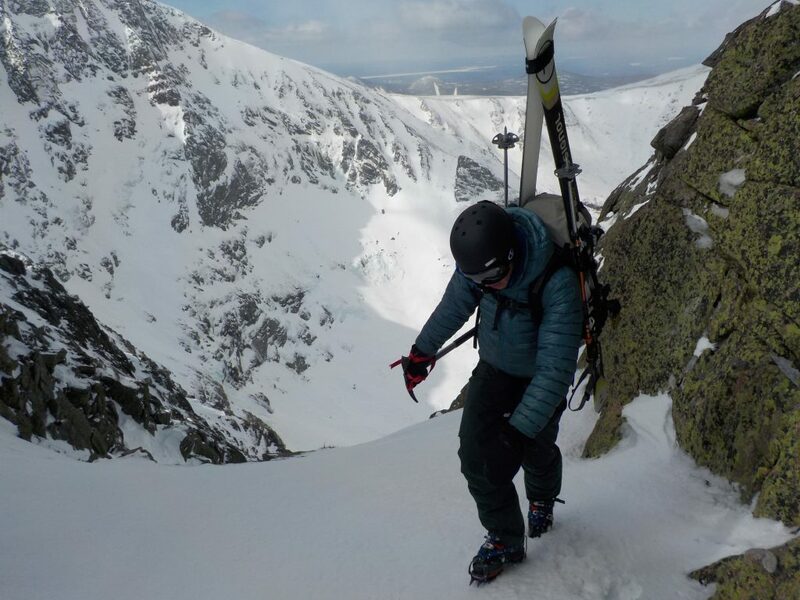 Geoff and I decided that we would ascend Chimney Couloir with intentions to ski down it. John (understandably) was not interested in climbing the couloir with us and descended on his snowboard back toward the cabin. 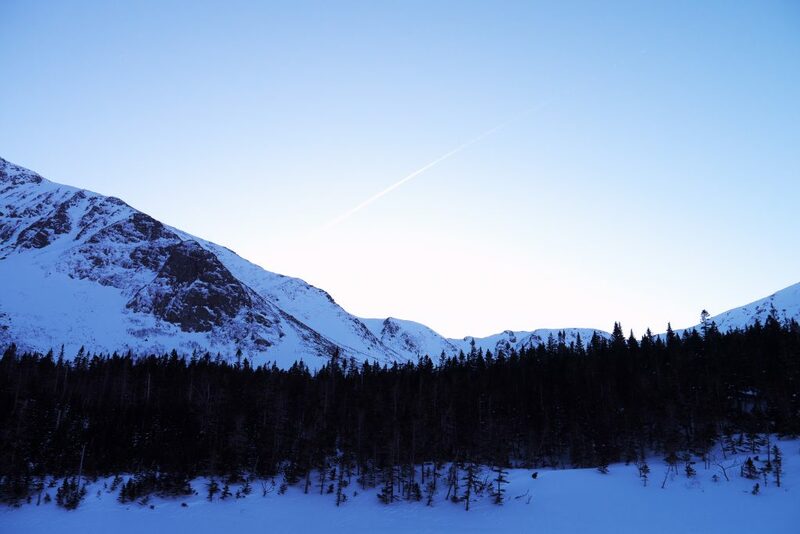 Geoff and I donned our crampons, ice axes, and strapped our skis to our backpacks. Chimney Couloir is a slightly winding gully surrounded by tall cliffs, ice and loose rocks. Geoff and I saw evidence of fresh rock debris below the couloir in the basin. We determined that this was likely from the major rain event we experienced in January. We were able to determine the spots in which these rocks released from, further up on our climb. 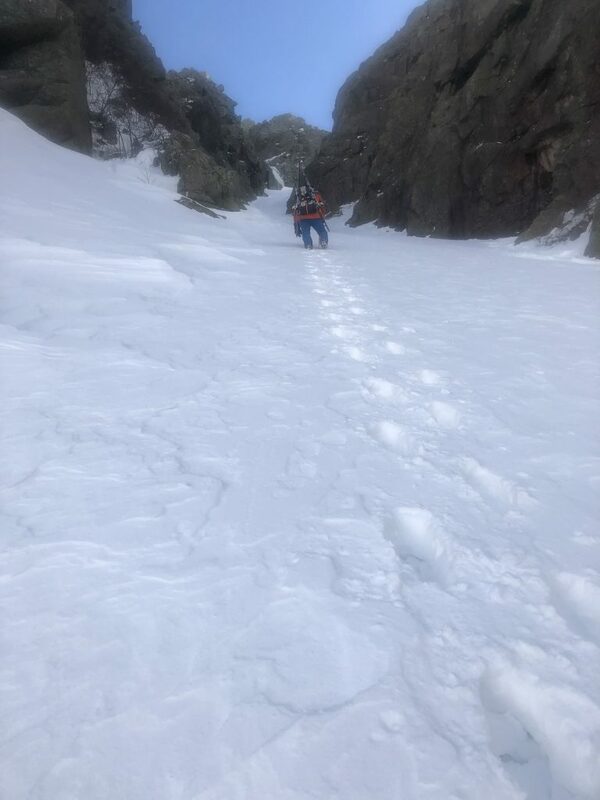 When we got about 2/3 of the way up the couloir, the surface began to transform into very hard snow and ice. I thought that the ice bulge might be a temporary section of our climb, and that it may turn back to softer snow a little higher up. 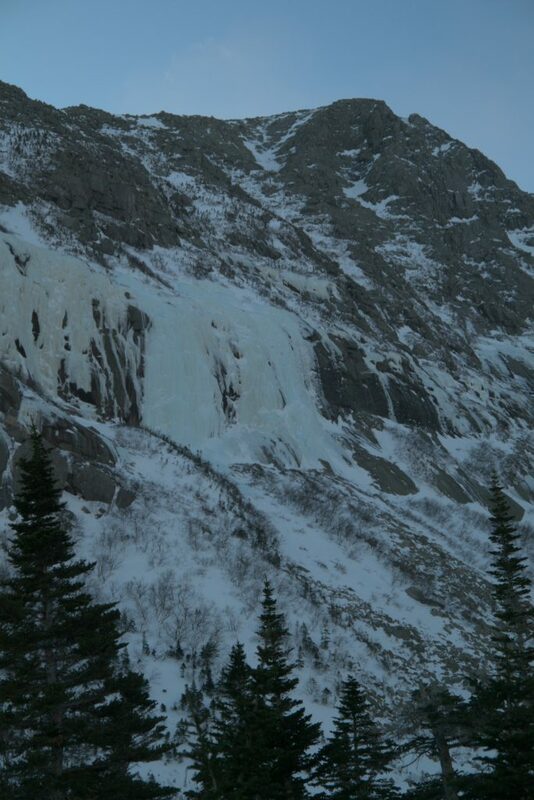 We could ascend higher to ski the upper portion, and carefully down climb this short, icy section. The Couloir got steeper (around 50-55 degrees) and more technical. The surface was nearly bullet proof snow & ice all the way to the krux and beyond. At this point, Geoff and I had climbed to a point where we felt our only choice was to continue upwards. If either one of us slipped or stumbled, it would likely result in an unstoppable slide to our death. This is not something I am exaggerating. If one of us had taken a fall, there would be likely be no chance of self arrest. We were free climbing, no ropes. To fall here would be a lot like a pinball in a pinball machine. Your body would get bounced and battered off of the cliffs on each side of the couloir, all the way down to the basin 2,000 feet below. When you are in a situation where you walk a fine line between life and death, there is nothing else but completing the task at hand. Your worries, your problems in life, your insecurities… they all dissolve. It’s beautiful and terrifying all at the same time. To walk that line makes you feel more alive, it releases endorphins. It’s addicting. The only thing that ran through my mind at this point was to not mess up. I have a loving wife and two children that I love more than anything. I have a responsibility as a father and husband to make good decisions. It is a stark contrast when even comparing the 23 year old me to the 33 year old me. The tolerance for taking risks and the process in which I made decisions had changed. I had people who depend on me. I was consumed with a feeling of selflessness instead of selfishness. Ryan arrives to the top of Chimney Couloir, exhausted and relieved. Geoff arrived to the top of the Couloir about 10 minutes or so before I did. He took the opportunity to snap some photos of me as I came to the top. The first words we exchanged were that we were in overwhelming agreement that neither of us were willing to down climb the route. We began to discuss a different route of descent. After we sat down, we snacked on some trail mix in the Col between Pamola and Chimney Peak. We discussed descending a very attractive gully that would lead into the Avalanche Brook drainage. Geoff seemed quite keen on doing this for a short distance. He suggested we stop part way down and ascend back up the ridge onto the Helon Taylor Trail. My gut instinct said no. 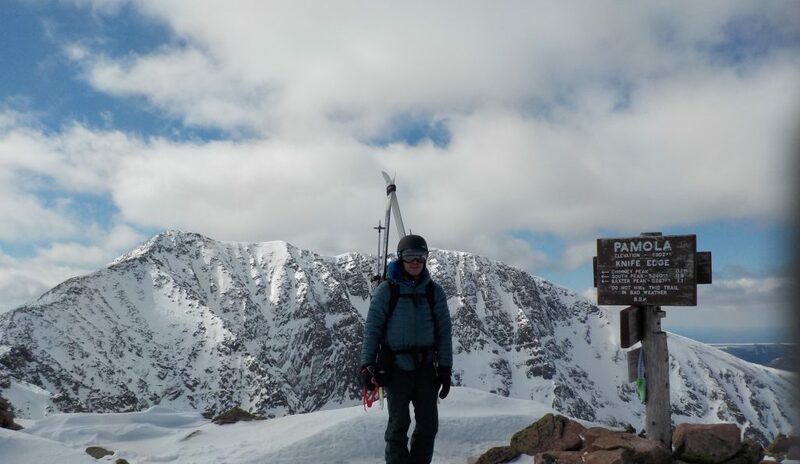 Geoff has far more experience than I do in ski mountaineering (he also has a few years on me! ), and after getting to know him a bit, I could see he was quite brilliant. 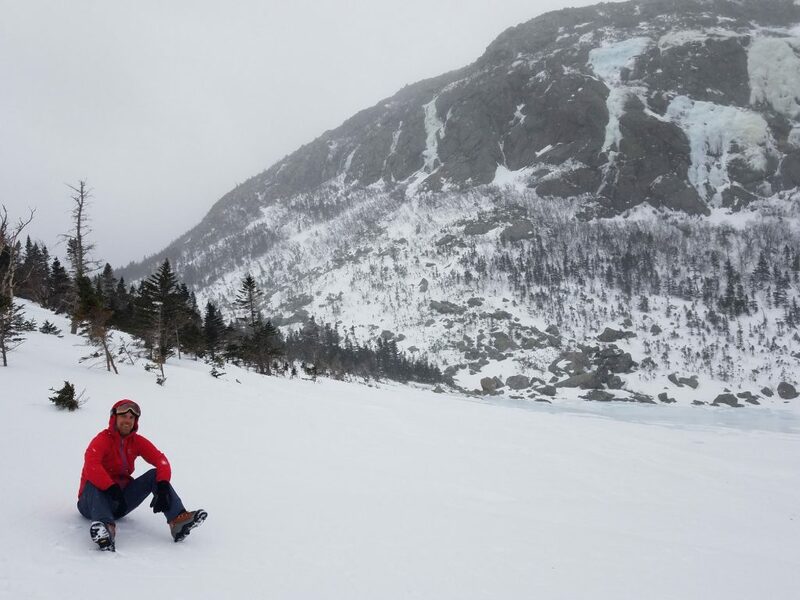 But I couldn’t help but feel that this would be a rash decision without doing any sort of snow pack evaluation on a different aspect than what we originally planned to ski. Perhaps he knew more than I did, but I just wasn’t sold on the idea. Geoff respected my feelings. Instead, I proposed that we climb to the summit of Pamola Peak. This took us almost no time at all because we were already less than 100 vertical feet from the top. 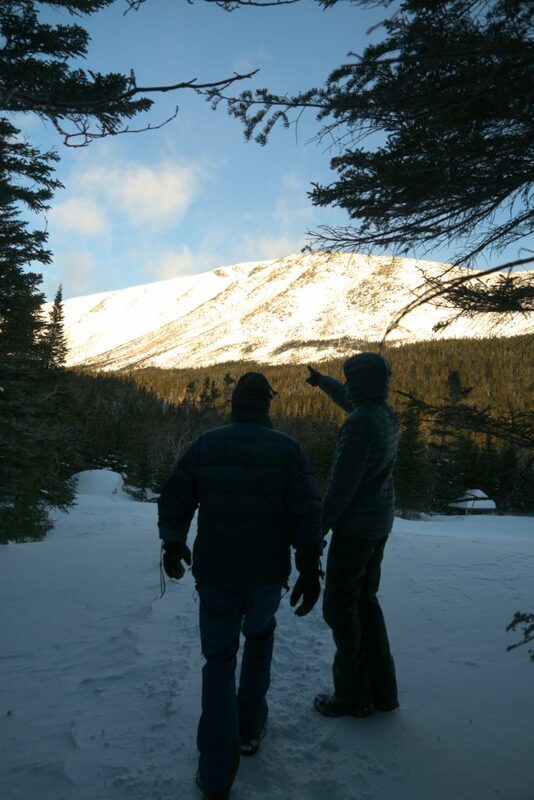 From there, I suggested we keep an eye out for some snowfields to the skiers left. That would be facing North/Northeast. 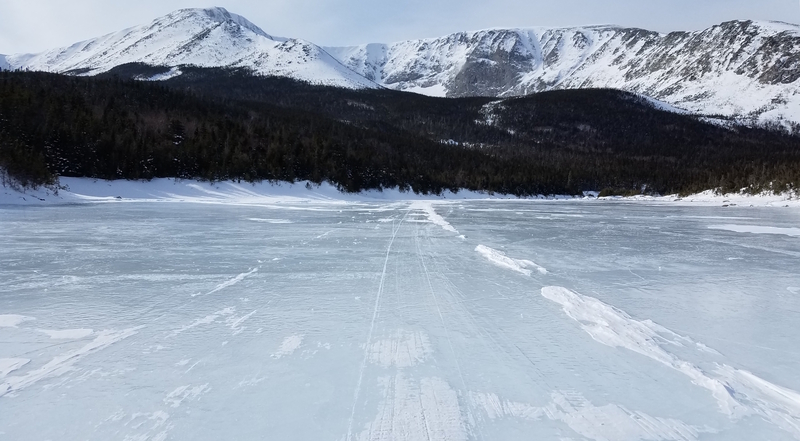 We descended about half a mile down the Helon Taylor trail before we spotted a snowfield that looked sufficient to ski down. The top 300 feet proved to be icy and wouldn’t be easy to hold an edge on. 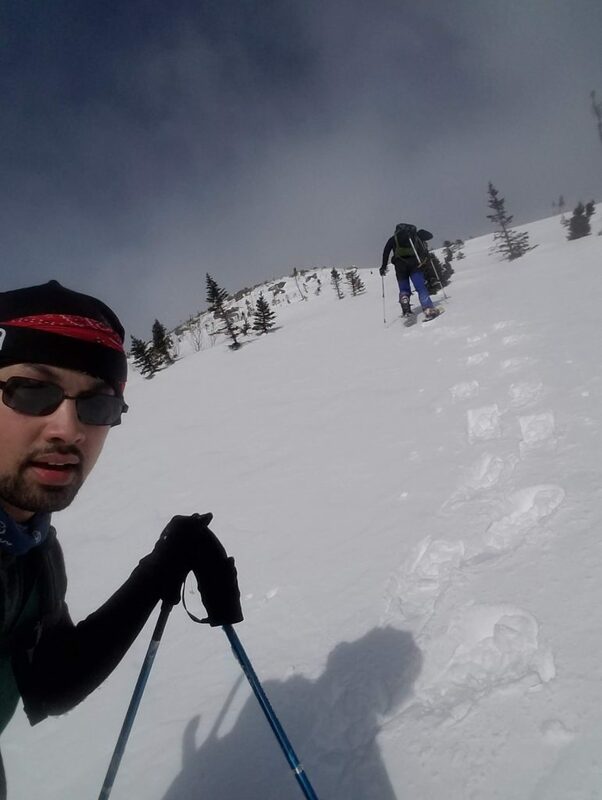 Geoff and I decided we better descend until we were positive that the snow surface consistency was safe to ski. We finally reached that point where it was safe to ski, and descended into an avalanche run out below Pamola’s northeast snowfield. We had a quick snack/water break and put our climbing skins back on our skis. At this point, the snow consistency changed over into a crusty top layer with powder underneath. 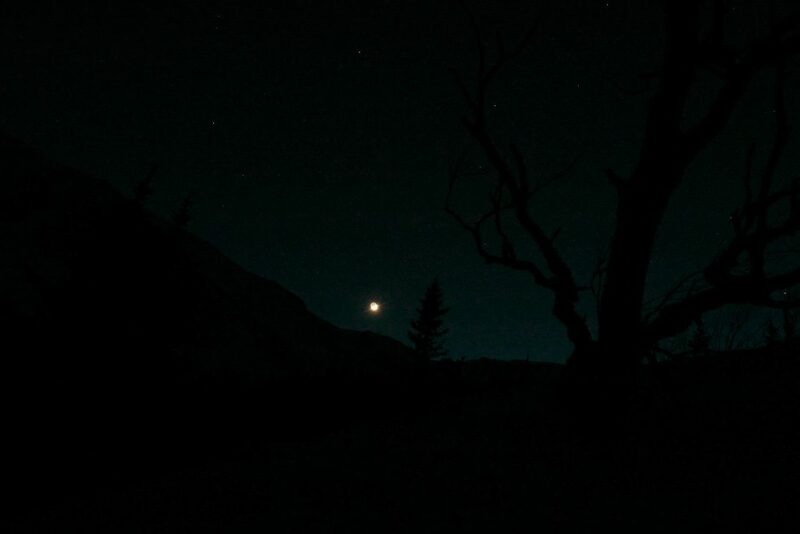 From there, we completed our circumnavigation of Pamola Peak in an impromptu bushwhack back to the cabin. No compass. Didn’t need it. 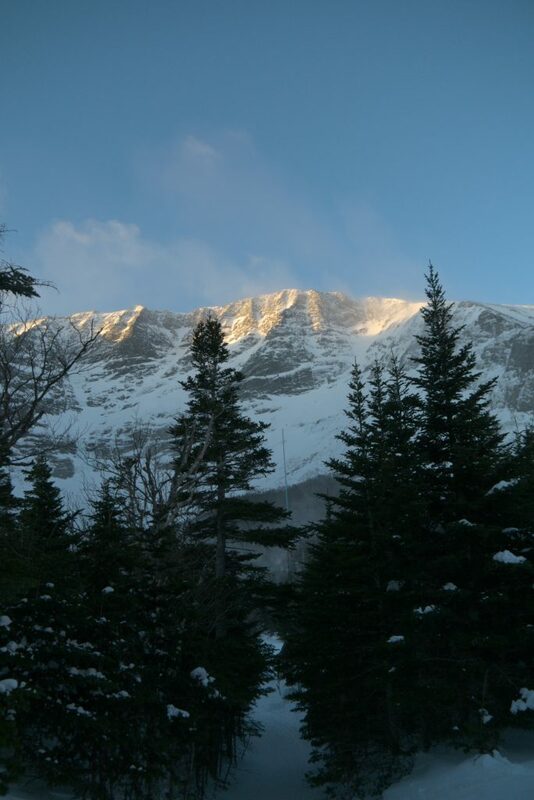 We saw landmarks from the summit which we used to gauge our route along the contour line back to the cabin. The going was pretty easy for the most part, but once in a while the terrain got riddled with awkward boulder fields that required removal of our skis in order to cross. Once in a while we’d get into birch and spruce thickets which would slow our pace substantially. But luckily these sections were short lived and the overall bushwhack was easy. I knew we were close when I could see smoke from a stove pipe about 1/2 mile away or less. I believe we crossed Dudley Trail at one point when we reached an area where a large rock slide was evident. Dudley Trail has been closed for a while now, and won’t reopen for some time to come. But it was marked with orange surveyors tape. 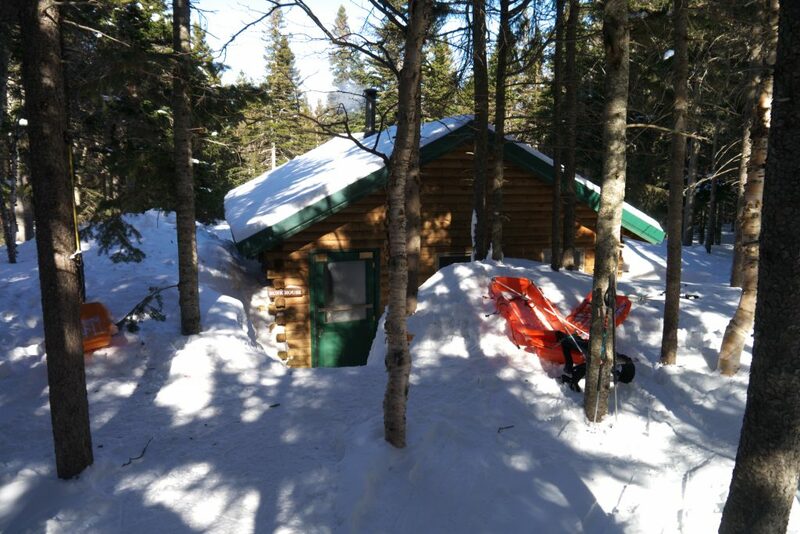 Shortly after crossing Dudley Trail, we saw a couple of folks who had been staying in the lean-to near our cabin. We knew at this point that we were very close to being done for the day. They had climbed toward the ice falls below Pamola to bask in the sunlight while it lasted. We joined them as they came down. 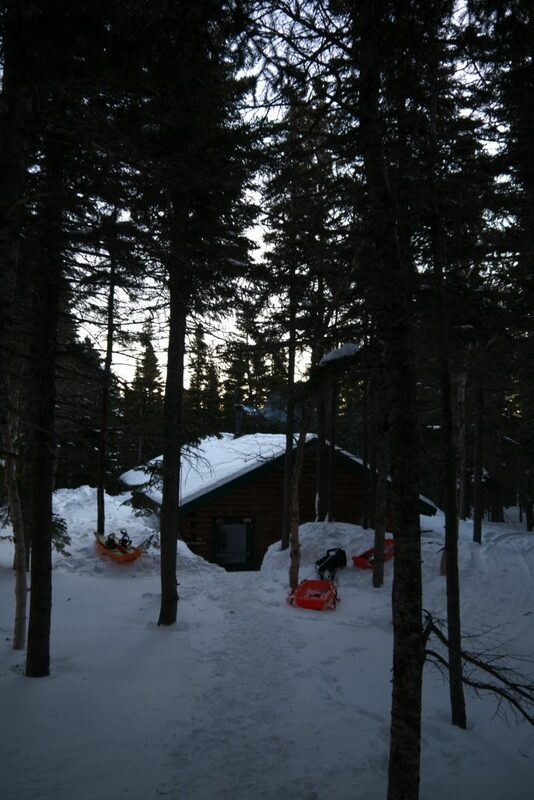 In about 10 minutes, we were back to our cabin and done for the day. I remember seeing Josie and felt as if I hadn’t seen her in a month. I have always loved and appreciated my wife since the day we met, but I felt different than usual. I felt closer to her, and could tell she probably worried about me a bit. Being a parent, you tend to get caught up in the chaos of raising children. Feelings can get pushed aside because you’re only trying to make it through each day. You get exhausted, burnt out, and emotions sometimes go on the back burner. The ranger was a little upset with us. Unbeknownst to me, we hadn’t signed in for our climb that morning. Nor had we gotten permission to climb the route we did without ropes. 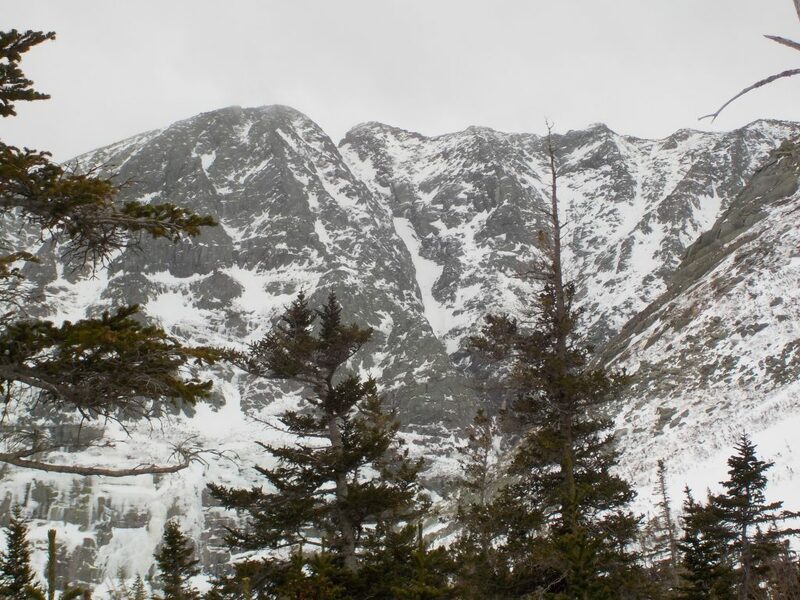 In Baxter State Park, if you plan to climb anything without ropes, you must get permission to do so. This is not guaranteed, and they more often than not enforce that you rope in with a partner for safety. The fact that we were off the mountain, and safe, she may have been a little easy on us. I felt badly. I am not one who likes to break rules, and I felt embarrassed that I was unaware of that policy. I had done a lot of research, read the BSP winter manual, and thought I knew everything there was to know in the way of rules. We appreciated her leniency as we hope to return here next year. When she came around to the cabin later that night to issue our weather report, she informed us that a storm would move in the next day. She then proceeded to tell us it would be a fine day to spend climbing vertical ice. Everyone in the cabin interpreted that as her way of saying, ‘you guys f*cked up.’ Lesson learned! 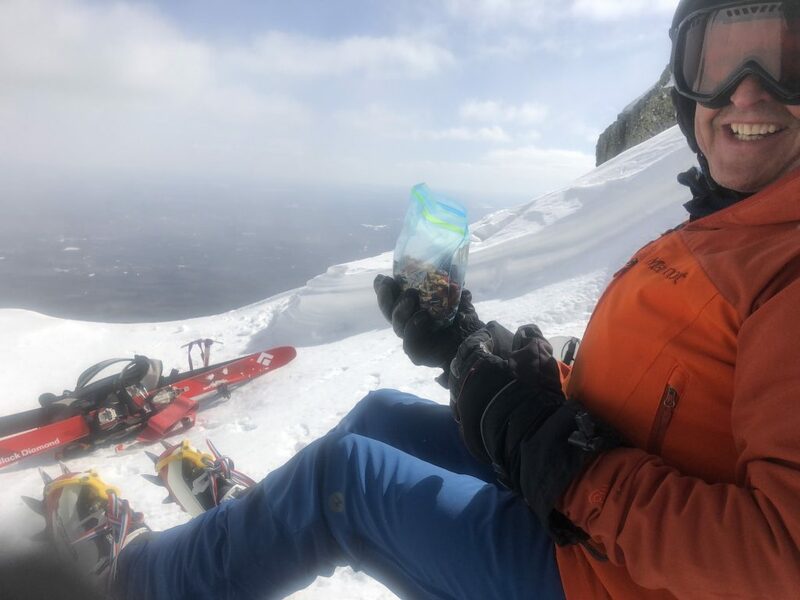 In other news, Adam and Reggie had a successful summit on Katahdin! The expressions on their faces in their pictures truly say it all. Pure excitement and adrenaline. 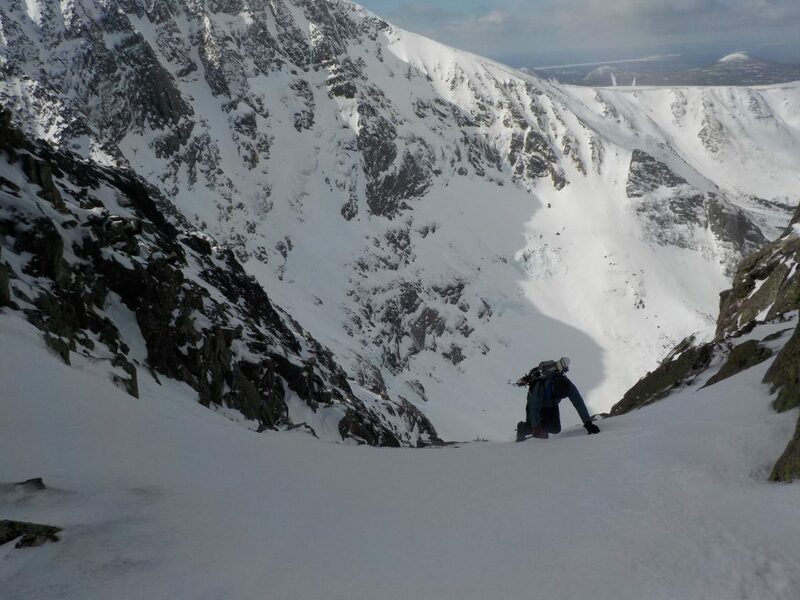 Also a growing experience for them as they have not done many winter climbs before. 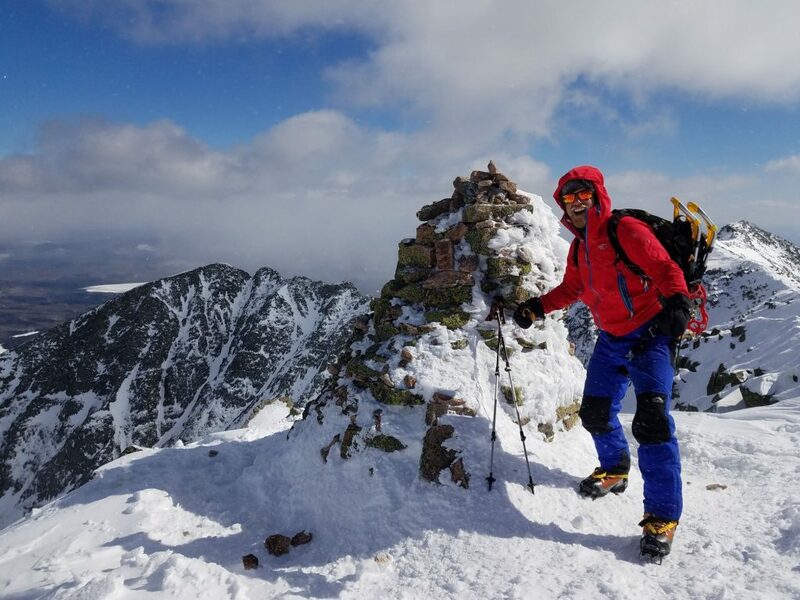 I would say that they set the bar pretty high with this one, as Katahdin is not an easy one to bag in the winter (or summer!). 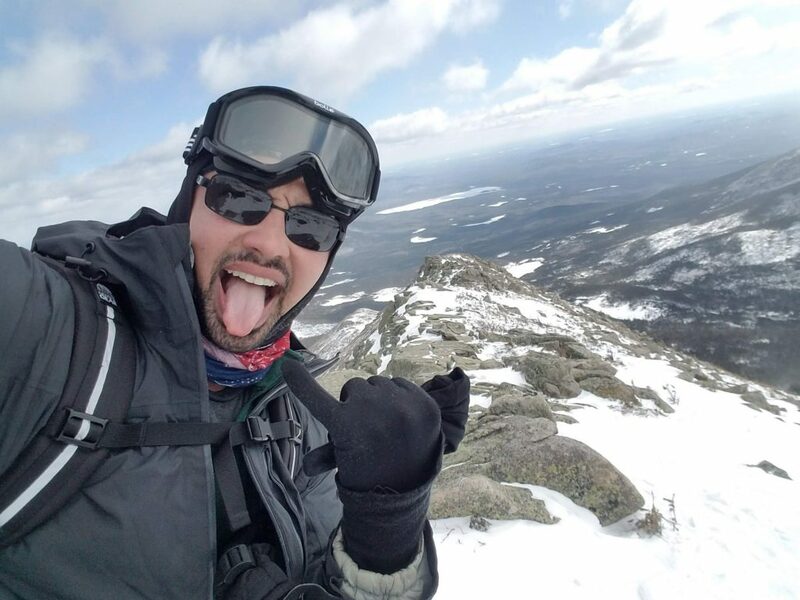 Adam Schoff on Mount Katahdin summit. Emily, Pete and Carrie (as best I can remember) made it to the top of (or close to) Hamlin Peak. Matt, Josie and John spent some time exploring the trails around Chimney Pond. 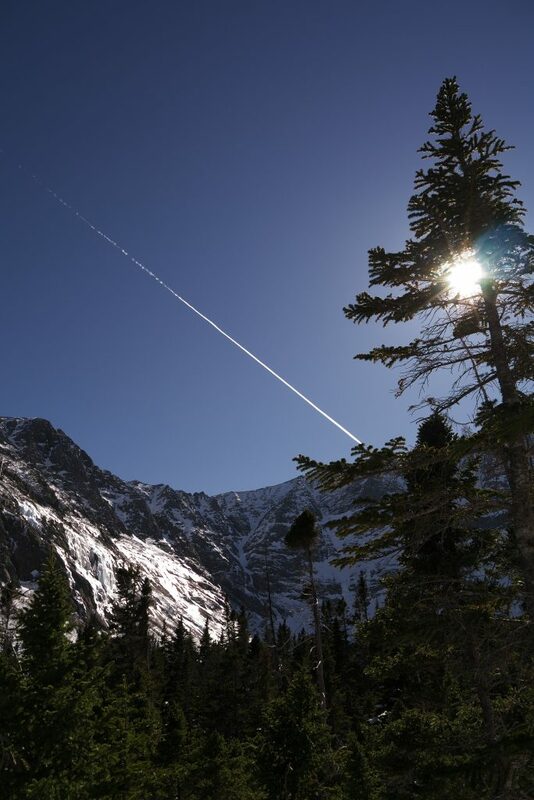 No matter what you do when you are here, it is time well spent in an awe inspiring landscape. Small reminders of civilization will be found everywhere you go. Stay tuned for day 3, coming soon! 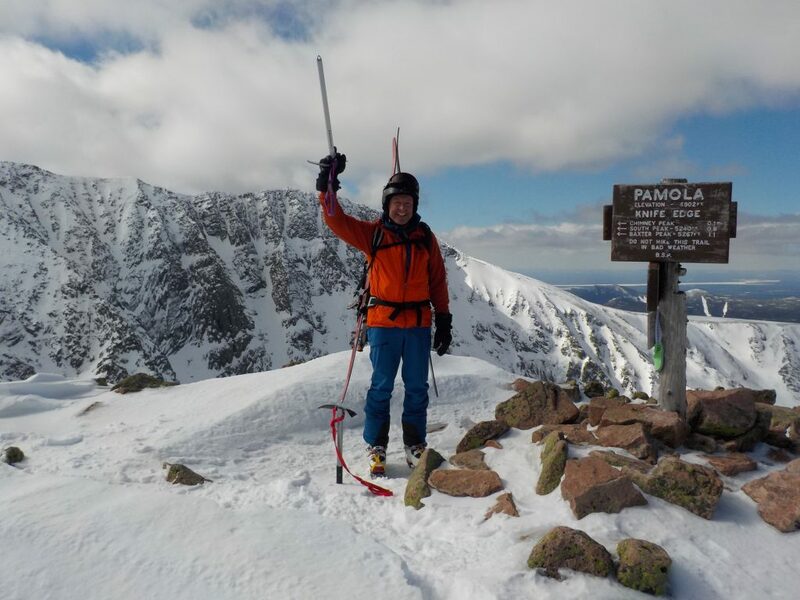 This entry was posted in Outdoor Adventuring, Ski Mountaineering and tagged #activelifestyle, #adventure, #backcoutryskiing, #grandyoats, #grandyoatsgranola, #grandyoatsmaine, #mainewoods, #mountaineering, #mountkatahdin, #skiingmountkatahdin, #skitouring, #wintercamping, Baxter State park, chimney pond, chimney pond cabin, chimney pond campground, climbing, crampons, freeskiing, ice axe, ice climbing, live your life, mountains, powder, realgranolas, ski mountaineering, skiing, skiing in baxter state park, skimaine, snow, take risks, winter by beettheratrace. Bookmark the permalink.